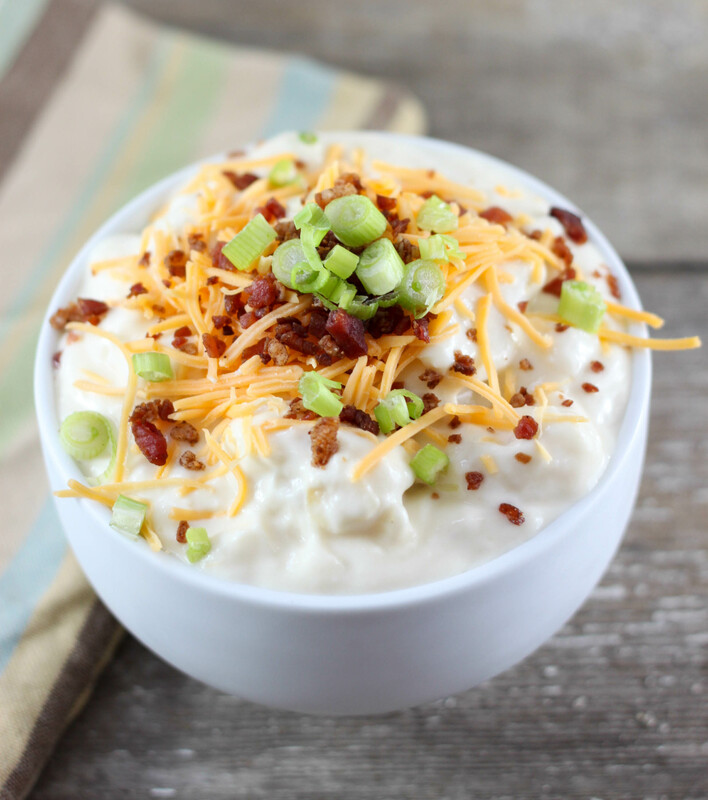 This Loaded Baked Potato Soup has all the flavors of your favorite side in soup form! 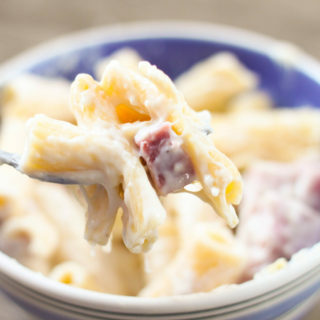 It’s a must make comfort food recipe! Farmers are known for loving meat and potatoes and my farmer is no different! So when I saw this recipe in my favorite cookbook (a fundraiser cookbook with recipes submitted by other farmers) I knew it would be a hit! We love soup around our house, some of our other favorites are Vegetable Beef Soup, Chicken Tortilla Soup and Fiesta Chicken Chowder. This recipe would be great to use up leftover baked potatoes. Just be sure to scoop out the pulp while the potatoes are still warm otherwise it makes it a bit more difficult. 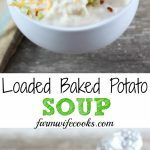 I am funny about my potato chunks in potato soup, sometimes they are too big and sometimes you hardly know you are getting potato so I love that this recipes doesn’t use chunks. However you may need to mash up the inside of the potato a little depending on how you scoop it out. Click here to watch the how to video and see step by step instructions. Bake the potatoes until they are done, carefully scoop pulp out while still hot and set aside. In a medium size skillet over medium or medium high heat melt butter. Gradually add flour while stirring to make a roux. Once flour and butter are mixed together gradually add the milk, stirring constantly until mixture is thickened and bubbly. Add potato pulp, salt and pepper. Turn the stove top down to low and add sour cream. Add extra milk if too thick for your liking. Garnish with cheese, bacon and green onions. Potato soup is so comforting and delicious. I love potato soup. I think I could just about eat it for every meal. 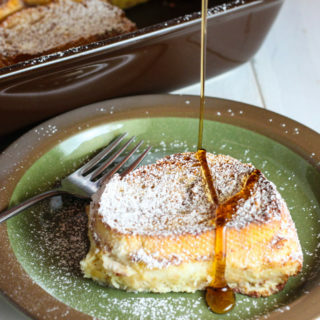 This looks sooooo yummy! 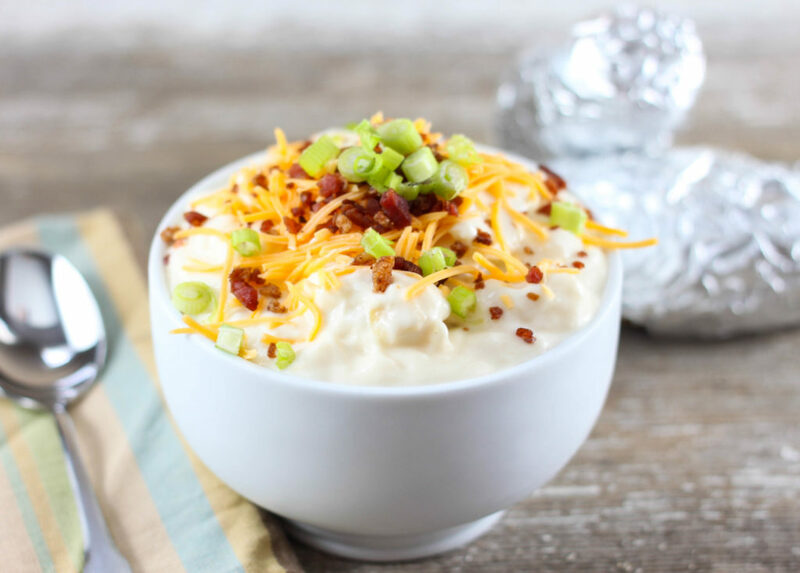 This Loaded Baked Potato Soup looks divine! I pinned it to make later! 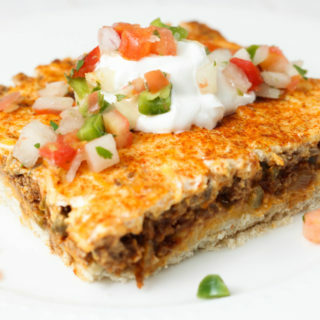 Need to make this soon! !